Underwater canyons have long been considered important habitats for marine life, but until recently, only canyons on continental margins had been intensively studied. Researchers from Hawaii Pacific University (HPU) and the Universtiy of Hawaii at Manoa (UHM) have now conducted the first extensive study of canyons in the oceanic Hawaiian Archipelago and found that these submarine canyons support especially abundant and unique communities of megafauna (large animals such as fish, shrimp, crabs, sea cucumbers, and sea urchins) including 41 species not observed in other habitats in the Hawaiian Islands The research is published in the March issue of the journal Marine Ecology. The researchers used both visual and video surveys from 36 submersible dives (using UHM's Hawaii Undersea Research Laboratory submersibles Pisces IV and Pisces V) to characterize slope and canyon communities of animals at depths of 350-1500 meters along the margins of four islands of the Hawaiian Archipelago. The coastlines of Oahu and Molokai were selected as examples of high, mountainous islands with large supplies of terrestrial and marine organic matter which can be exported down slopes and canyons to provide food to deep-sea communities. Nihoa Island and Maro Reef were chosen to represent low islands and atolls that are likely to export less organic matter to feed the deep-sea fauna. Eric Vetter, the lead author of this paper and a Professor of Marine Biology from HPU, had previously studied four canyon systems off the coast of California and found that the productive waters along southern California had resulted in the delivery and accumulation of substantial amounts of organic material. 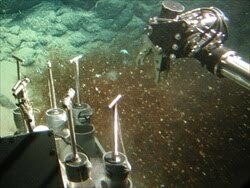 "Craig Smith (Professor of Oceanography at UHM and co-author of this study) and I wondered if the same dramatic contrast in benthic food resources between canyon and non-canyon settings seen in continental margins would also occur on tropical oceanic islands," says Vetter. "We reasoned that the low productivity in tropical regions would result in reduced source material for organic enrichment in canyons and that steep bathymetry combined with curving coastlines would limit the area over which material could be transported to individual canyons. On the other hand we thought that any amount of organic enrichment might have a measureable effect given the very low background productivity." Canyon systems can enhance abundance and diversity of marine life by providing more varied and complex physical habitats, and by concentrating organic detritus moving along shore and downslope. On most continental margins, the continental shelf and slope are dominated by soft, low-relief sediments; in contrast, canyons crossing these margins often have steep slopes, rocky outcrops, and faster currents that can support fauna with diverse habitat requirements. The margins of oceanic islands generally are steeper than continental margins, making the physical contrast between canyon and non-canyon habitats potentially less dramatic than along continents. "We wanted to learn, given all of these differences, if tropical oceanic islands would be regions of special biological significance, particularly in terms of productivity and biodiversity," says Vetter. To conduct the research off Oahu, Molokai, and Maro Reef, Vetter, Smith and UHM Doctoral student Fabio De Leo took turns in the submersibles counting marine life on the ocean bottom using visual transects and recording results into a voice recorder. The survey off of Nihoa Island was conducted using a video recorder attached to the submersible. The results of the 36 surveys showed that the highly mobile megafauna (like fish, sharks, shrimp and squid) were much more abundant in the canyons than on the open slopes at all depths studied. This suggests that canyons provide an especially good habitat for mobile species that are able to feed on accumulated organic matter but can escape the physical disturbances in canyons resulting from high currents and mobile sediments (e.g., migrating sand ripples). "Perhaps the biggest surprise of this study was the large number of species, 41, that we found only in canyon habitats", says Smith. "This suggests that canyons support a substantial specialized fauna that would not exist in the Hawaiian archipelago in the absence of canyons. Thus, submarine canyons are contributing uniquely to biodiversity in the islands and merit careful attention for environmental protection and management." The elevated abundance and biodiversity of megafauna (especially highly mobile species of fish and crustaceans) in canyons suggests that those environments experience greater food availability, and may provide critical habitat for commercially important bottom fish and invertebrate stocks. "From a conservation standpoint, these regions would be ideal candidates to become Marine Protected Areas (MPAs), especially due to the higher turnover of species diversity when compared to regular slopes", says De Leo. "If we prove that the animals are using the canyons as a feeding ground because the organic debris accumulates there and nowhere else outside the canyons, that's another argument for an MPA". Adds Smith, "if we allow the Hawaiian canyons to be overexploited or impacted by human activities such as dredge-spoil dumping, there is likely to be a significant drop in biodiversity in the deep waters of Hawaii. Clearly, canyon habitats merit special attention for inclusion in Hawaiian MPAs." Future studies by the team of the Hawaiian canyon fauna include analyses of the stable carbon and nitrogen isotopes in shrimp, urchins and other bottom feeders to identify their main food sources. Because different potential food sources, such as land plants, seafloor algae and phytoplankton, often have different stable isotope "signatures", these analyses will help the researchers to understand what exactly is fueling the rich animal assemblages in the canyons. "We need biochemical proof that the canyons are really channeling this type of material," says DeLeo. "Carbon and nitrogen isotopic signatures could tell the difference between the detrital plant material and the phytoplankton material pools, so you can see if the animal in the canyon is eating phytoplankton cells coming from pelagic production or macroalgae coming from the coast." Vetter says that their current research is also formulating conceptual models that will allow the researchers to predict which features associated with different canyon systems act to influence biological patterns including animal abundance and diversity. "DeLeo's PhD research will include data on megafauna and macrofauna (smaller animals living in the sediments) patterns in canyons along the U.S. West Coast, Hawaii, and New Zealand, which should make important strides here."